Puerto Naos on the west coast is a quiet out of the way tourist destination. After a short drive over the mountains of La Palma with many fantastic natural landscape impressions, you reach Puerto Naos on the Westside of the island. There are a lot of other things to see in the surroundings of Puerto Naos but we will focus on diving and snorkeling. Directly from the beach you access diving waters via the sloping seabed. The slopes give suddenly way to 50m-deep furrowed rocky terrain. 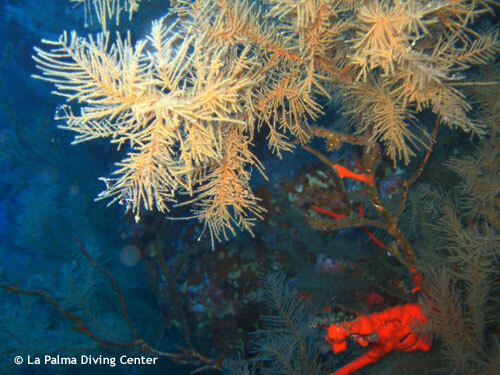 Black corals can be sighted at depths of 35 meter. Puerto Naos is a diving place with an abundance of species, especially eels. Parallel to the coast, you will find a drop off that needs several dives to see everything. Along the edge you can let yourself float over the impressive depth (8 – 40m). Close to the Marin Reserve in Puerto Naos Nord there are a lot of various species in a close area. 50m from the beach is a dive center with emergency equipment and O2. Discover the unique underwater world of La Palma! Dive today in the unique underwater world of La Palma with Casa de Buceo, the only Dutch dive center on La Palma. Casa de Buceo stands for diving with pleasure, quality and safety in a relaxed environment. We always dive in small groups and give personal attention. We speak Dutch, English, German, Spanish and French. The underwaterworld is breathtaking and the underwaterlife around La Palma is abundant. We can offer you the full range of PADI Scuba Diving Courses, from PADI Open Water Diver (beginner) to Divemaster (pro-level). If you want to know what it is like to dive into the Atlantic Ocean with full equipment, we can offer you the Discover Scuba Diving program. During this experience you take your first steps in scubadiving, under the guidance of an Instructor. We also organise snorkeltrips - for everyone - because snorkeling on La Palma is absolutely fantastic!